Can Cloud Solutions for Small Business Help My Practice with HIPAA Compliance? From HIPAA to MACRA, healthcare is rife with federal and state patient care regulatory requirements and reimbursement regulations that dictate how you get paid. As recently as five years ago, providers kept patient data behind firewalls in an on-premise facility server room because they were worried about compliance rules. 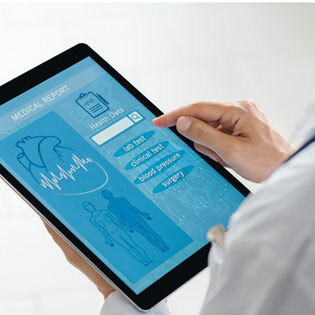 Today, that’s changing, as hospitals are increasingly storing patient data in the cloud and adopting IT architectures that make use of on and off-site hardware and software. Whether it’s an EMR or practice billing software, medical practices have widely accepted cloud solutions for small business as a way to remain competitive and cut costs. While compliance remains a big issue in healthcare, how can cloud-computing models keep a medical practice or hospital legal? According to CenturyLink, healthcare cloud solutions for small business have grown to a $5.4 billion industry this year. After a decade of cloud-based services, security and infrastructures have evolved to meet the needs of the healthcare industry. Compliance with healthcare regulatory requirements is standard operating procedure for most cloud providers. Cloud solutions for small business include healthcare security protocols that comply with HIPAA mandates. Most pundits believe that healthcare providers will not be able to comply with the latest MACRA reimbursement rules without using the cloud to improve patient access to care. Medical practices that are concerned should speak with cloud providers to understand exactly how they comply with HIPAA or other rules. Typically, data encryption of patient information while it’s traveling to the cloud, and while it’s at rest, are just two ways that your cloud solutions for small business providers will ensure compliance. Get a free assessment to find out if your practice is IT compliant. In fact, it should be noted that your cloud solutions provider is just as liable for compliance as your practice; that is why the Cloud Council recommends a business associate agreement with your cloud solutions for small business providers. This helps define the shared responsibilities between you and your vendor. Traditional IT models hold compliance responsibility strictly under the medical practice roof. Cloud services share the physical, administrative, and technical compliance requirements between the vendor and your practice. What’s Driving the Cloud Migration? For a fraction of what you’d pay to hire a full-time IT team, cloud-managed service providers can handle the security of your practice data. Physician practices do not typically have the kind of security that you would see as “business as usual” at a cloud-based data center. Practices don’t have security to guard their physical site and they typically don’t monitor their network for security breach 24/7/365. Managed service providers and other cloud solutions for small business providers offer all of these as part of their IT infrastructures. Data protection is a standard part of doing business with a cloud provider. While many small to mid-sized medical practices have transitioned to EMRs, some still store patient data in hard files. This cumbersome practice is also difficult to secure. There are technical safeguards in HIPAA that your cloud provider can help you meet, including controlling network access and following the rules related to how data is transmitted and stored. Disaster recovery is another area where cloud computing is a natural choice. Creating a virtual machine and storing backups offsite is just one-way cloud technology can benefit the small practice. Too, a managed service provider can help your practice create a disaster recovery plan that can help you get back up and running in the event of a crisis. These are just some of the benefits driving the cloud migration of the small to mid-size practice. Relying on your solo practice to manage all the daily compliance complexities is a drain on staff time and resources. A managed service provider like TOSS C3 can help mitigate your security risks and ensure compliance in the cloud.